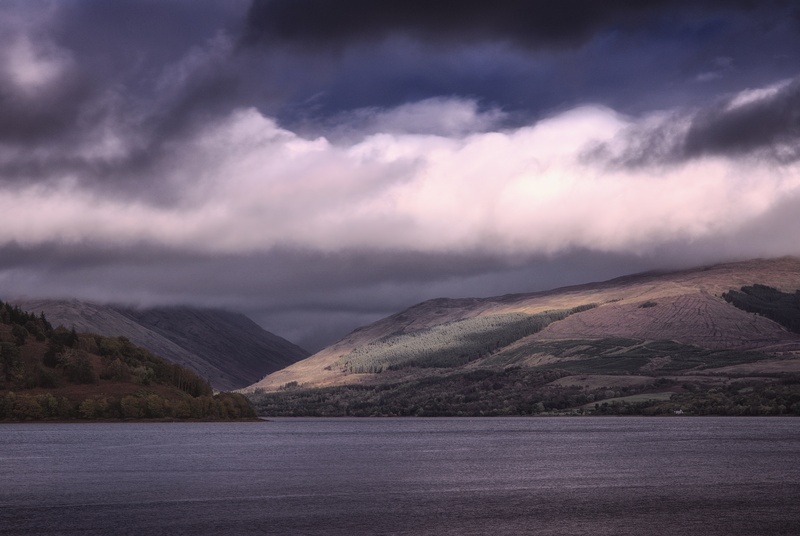 For several years, on and off, I’ve attended an annual Photo-Walk based in Inverary, Argyll. This year was no exception – always good to catch up with friends I’ve met on the walk previously. As always, Argyll is a favoured place and Autumn a favoured season; the combination of light and landscape makes for enjoyable drives. An auspicious viewpoint – right next to the public toilets on Inverary front – but it makes for a cracking view up the loch toward a spot of sunlight illuminating the hills around Ardkinglas. 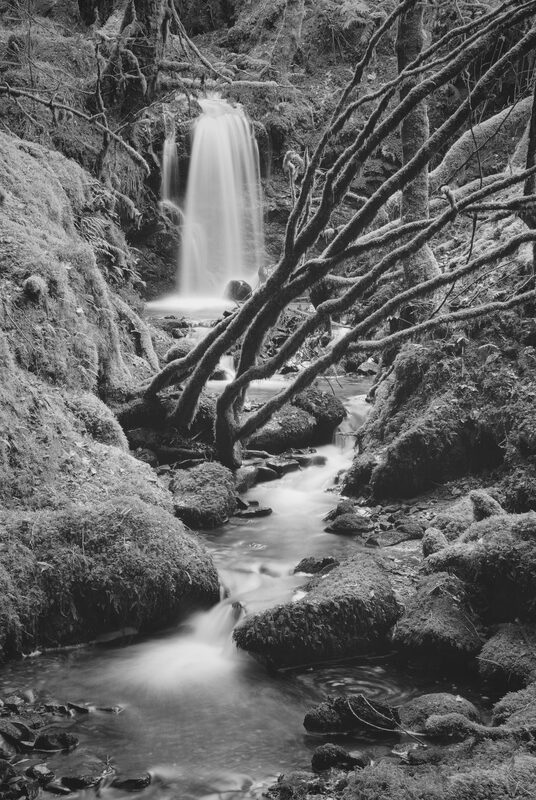 This time the organizer, Richard, had brought a couple of props – most notably a bottle of Isle of Jura Superstition and I had one or two ideas in mind “just in case” we ended up at a particular favourite waterfall. 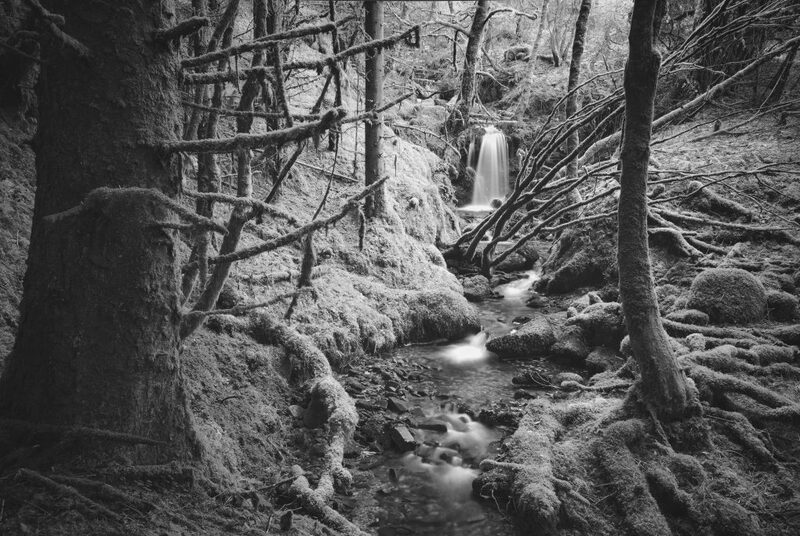 We made our way down the slippery embankment to the burn, where I set up tripod amongst the boulders to maximize the lead-in lines of water flowing around the rocks up to the waterfall – tripod placement was fairly tricky with a wide-angle (24mm) lens and the slippery lumpy terrain to negotiate – and then as the camera was busy taking 20s exposures (4x with pixel-shift) I trotted back and forth through the water firing a flash-gun down onto the bottle of whisky and surrounding rocks (manual triggering at 1/8 power with the diffuser out and reflector down to stop the light itself registering in the scene). I quite like Isle of Jura whisky… not necessarily on the rocks though. 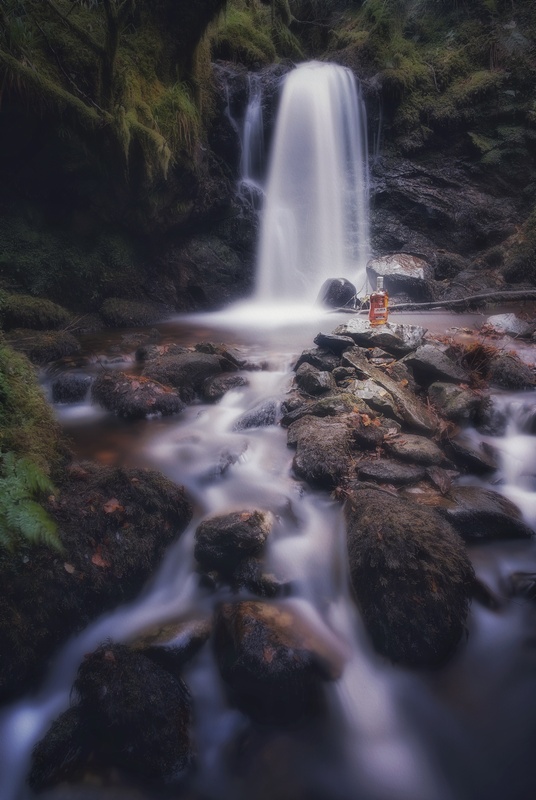 I had originally experimented focussing in on the bottle itself and using a wide aperture to restrict depth of field, but that did not fall naturally through the scene – the waterfall was still sharp behind – so I stopped-down to make everything in focus and relied on post-processing tricks in Affinity Photo to draw the eye onto the bottle differently instead – some Orton effect and various soft-light Gaussian blurs, masks and elliptical gradient fills to boost the saturation, make it all glow and still leave the bottle sharp and bright. The final toning came from Snapseed of all things. I’ve done a little product-photography before but never tried blending [bad pun intended] it with landscape work, let alone pairing it with light-painting, but I think it worked – certainly compared to the straight shot, the bottle with its amber glow just makes it. This entry was posted in Argyll, art, Highlands, intimate-landscape, photos, Scotland, water and tagged Affinity Photo, aqua-vitae, blur, bottle, Dubh Loch, glow, Inverary, landscape, manipulation, Pentax K-1, photography, product, snapseed, uisge-beatha, Water, waterfall, whisky.